The vsdc free video editor is a very functional program for non linear cutting and editing videos. The freeware with german user interface supports a variety of formats and offers all sorts of effects. Additional features such as a built in tool to burn the created movies and the video recording from screen to complete the software. Also off the transitions there are a variety of video and audio effects available directly on the object to be applied, for example, color filters, text overlays, or sound distortion. The arrangement of the individual components of the resulting film is done by means of subpixel accuracy, which is a highest possible precision in the positioning. The vsdc free video editor can full hd movies in the most popular formats avi, dvd, vcd/svcd, mpeg, mp4, m4v, mov, 3gp/3g2, wmv, mkv, rm/rmvb, flv, swf, amv, and mtv, and produce some other formats reading process. Preset profiles you can also choose the suitable output format for certain devices, such as smartphones or consoles produce. With a built in tool for burning a dvd can movies also the same played back on an optical disc. Practically is also the feature to record the screen content as a video, which then can be edited. Also the recording on tuner is possible. The vsdc free video editor counts whether its functionality among the free video editing applications the best and can be used for the usual home use is actually no wishes open. The user interface is understandable and it should to the inclined user to no challenges. A popular alternative to vsdc free video editor, however with less possibilities, is the movie maker of microsoft, the software collection windows essentials 2012 can be downloaded. Note: the installer by default tries to, really unwanted additional software install. This can be done during the installation via the selection of the item "custom installation (advanced user)" be unchecked. 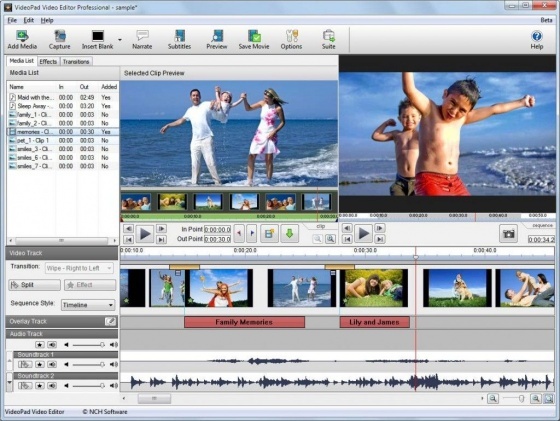 You can free download Free Video Editor latest full version from LoadSafeSoft.